Way But Loose", one of the many movies they appeared in together. He is another one of those actors who you would know to see, even if you didn’t know his name. Probably best known for playing alongside Clint Eastwood in a number of movies, Geoffrey Lewis also had a number of roles in various TV shows, including playing the character that drags The Man from U.N.C.L.E. out of retirement in 1983. Eventually he had a daughter who may have eclipsed him in name recognition, but not in contribution to the pop culture of a decade. Geoffrey Lewis had a pretty prolific career in the movies in the 1980s. He opened the decade appearing in “Bronco Billy” with Clint Eastwood, after appearing alongside him in “Every Which Way but Loose” and “Any Which Way You Can”. 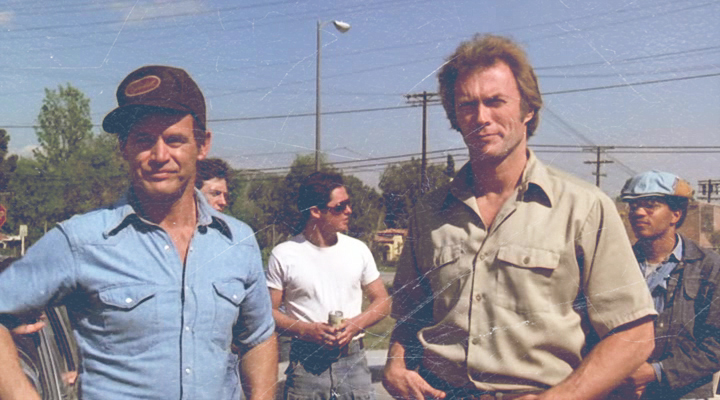 He actually began his association with Eastwood back in 1973 with "High Plains Drifter". Lewis would close out the decade, playing opposite Eastwood in 1989’s “Pink Cadillac”. 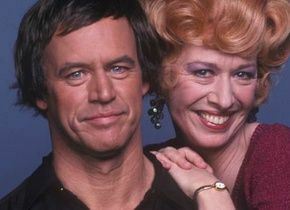 Geoffrey Lewis with his co-star Polly Holliday in the 1980s comedy "Flo". It was just one of many guest and recurring roles he had in TV in the decade. If you watched as much TV in the ‘80s as I did, you definitely would recognize Geoffrey Lewis. He had a guest starring role in pretty much everything you can imagine, from comedy to drama to night-time soap opera. A sample of the shows he appeared in was “Lou Grant”; “B.J. and the Bear”; “Little House on the Prairie”; “After M*A*S*H”; “Blue Thunder”; “The Yellow Rose”; “Falcon Crest”; “Highway to Heaven”; “Spenser: For Hire”; “The Fall Guy”; “Scarecrow and Mrs. King”; “The A-Team”; “Magnum P.I.”; “MacGyver”; “Designing Women”; “The Golden Girls”; “Matlock”; and much more. He often played the bad guy, and almost just as often was most comfortable in westerns. That’s where he played alongside Tom Selleck and Sam Elliott in “The Shadow Riders”. The role that sticks out for me though, is in “The Return of the Man from U*N*C*L*E*: The Fifteen Years Later Affair”. He plays Janus, a turncoat U*N*C*L*E* agent who has resurrected their arch-nemesis T*H*R*U*S*H*, and is threatening to detonate a nuclear device. Only one man can deliver the ransom – Napoleon Solo, the original Man from U*N*C*L*E*. Geoffrey Lewis was awesome in the role. Lewis also had regular spots in two series. He open the decade in 1980, playing Earl Tucker in “Flo”, a spin-off of the series “Alice” starring Polly Holliday. I remember it well, Monday nights I believe, on Channel 7 on peasant vision. Flo buys a rundown roadhouse and names it “Flo’s Yellow Rose”. Earl Tucker was the bartender, who really did not like working for a woman. “Flo” was cancelled after two seasons. Two years later, Geoffrey Lewis was back, this time in the western spoof “Gun Shy”, a series based on the Disney movie “The Apple Dumpling Gang”. A gambler wins two children in a game of poker and moves to California. He played Amos Tucker, a wannabe outlaw along with his partner in crime Theodore Ogilvie (played by Tim Thomerson). There are two clips to the left advertising "Gun Shy". The show only lasted six episodes before cancellation. 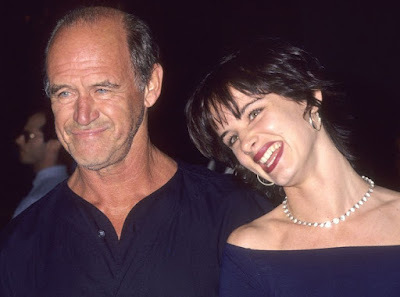 Geoffrey Lewis with his daughter actor Juliette Lewis. It pains me to see some of the eulogies written about Geoffrey Lewis lead with the fact he is Juliette Lewis’ father. Geoffrey Lewis was much more than that. He was a prolific actor who began his career in the 1970s and kept on working well into the 21st Century, making his last appearance in “Retreat!” in 2012. He also will appear posthumously in 2016 in “High and Outside”. The fabric of television and movie history is woven not just by the stars. It is the supporting cast members who can provide a rich texture and environment for the stars to thrive. The 1980s is filled with character actors who appeared in a wide range of shows, offering their talents as bad guys, fall guys, wise guys, and just guys. Geoffrey Lewis may have been one of the best to play any guy you wanted.